Access 2010 offers several advanced options for creating and modifying reports. 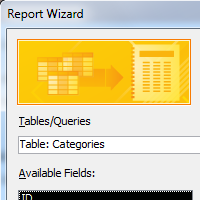 The Report Wizard is a tool that guides you through the process of creating complex reports. Once you've created a report, whether through the Report Wizard or the Report command, you can then format it to make it look exactly how you want. In this lesson, you'll learn how to use the Report Wizard to create complex reports. You'll also learn how to use Access's formatting options to format text, change report colors and fonts, and add a logo.